Tasha Lawrence and Lee Stellars. Photo by Seth Freeman. A grime-filled room in a long-abandoned hotel; a lone, exposed light bulb in the ceiling; steel brackets and bare 2X4’s at both the front and bathroom doors hinting at the menace and mayhem to come. A perfect night out, eh? 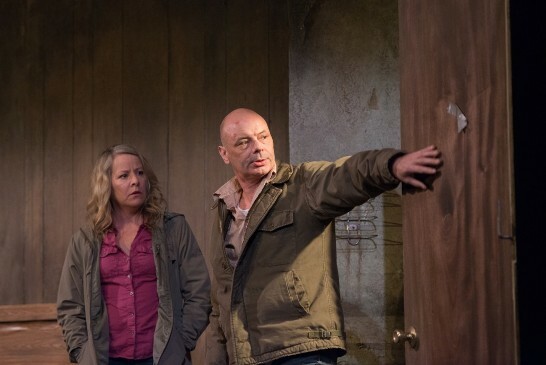 Kicking off this summer’s Contemporary American Theater Festival, now celebrating its 25th anniversary, is Stephen Dietz’s latest, a truly dark piece of work, On Clover Road. Like all good thrillers it has action, surprises and reversals of fortune galore. Moreover like the classics of film noir, to which Dietz pays a more than passing compliment, there isn’t a single character here you can trust. Not one. No sooner are you drawn in by the latest plea for sympathy, you suddenly find yourself questioning their reliability and motives. You get the distinct impression that every word Dietz’s characters speak, every syllable, every glance, is a lie. Which, of course, makes On Clover Road a delicious exploration of the darkest corners of human nature. Two figures enter this dim room (nicely executed by David M. Barber); Kate is a middle-aged woman who, at first, appears to be a stock character from Hallmark TV: the mother desperate to be reunited with her cult-member daughter. Accompanying her is the de-programmer Stine, the kind of blunt, hard-boiled, seen-it-all antihero we’ve known and loved for years. Tash Lawrence is compelling and of course utterly devious as Kate, a mother who presents herself as an innocent victim but who is almost immediately forced to confess to her many personal demons. Lawrence is especially riveting as Kate has to cope with a death-spiral of psychological and physical violence over which she has absolutely no control. Meanwhile Lee Sellars’ Stine grabs you by the scruff of the neck from the git-go, and is just as effective at locking our gaze on his every move as Stine is at locking Kate into the rom. He has his own share of demons, of couse, and only releases his firm grip with great reluctance. Over the course of On Clover Road we meet two young women who have been caught up in a cult whose ideology promises self-esteem and empowerment, but at a terrible price. Actress Molly Carden, the first cult-member to fall into Stine’s clutches, manages the lies and layers of her character with aplomb; meanwhile Molly Brown, the second to enter, offers us a chilling demonstration of a truly cultic mind. (Note: the program simply identifies Carden and Brown as “Girl” for reasons that only become clear as the show unfolds). The quiet, menacing leader of the cult is Harris McClain, played here with truly disturbing ease by Tom Coiner. McClain, a former insurance salesman, openly discusses his simple formula, which has attracted the young harem of vulnerable who now flock to him, and Coiner delivers this finely-honed monologue to devastating effect. One key to appreciating Dietz’s work here is to understand that thrillers have no use for the traditional, slow development of character that is the drama’s stock-in-trade. Secrets normally withheld until the final scene are revealed early in On Clover Road, and with brutal efficiency. Why? Because the action is the thing, the battle for supremacy; what we have here is a collection of flawed human beings trying in their own devious ways to get control of their lives—not to mention the lives of others. Therese Bruck’s costumes effectively evoke the lower echelons of society, from whom all the characters here have emerged, right down to the eggshell-blue dresses of the young women caught up in a cult whose compound looms menacingly in the mind just off-stage. As fight director, Aaron Anderson deserves special praise for a very tightly-organized and well executed sequence of fights, which I would call the highlight of the show if it weren’t for Dietz’s terrific writing (let’s just say they share the bill). John Ambrosone’s lighting, meanwhile, is as deft as it is minimalist; he achieves a remarkable Expressionist effect, larger-than-life shadows cast against the wall, with the simple placement of Stine’s work light downstage. Ed Herendeen, CATF’s founding Artistic Director and the director of On Clover Road, has assembled a fine cast and created a truly “great reckoning in a little room” here. Unnerving and intensely physical, this is a fitting launch for the festival’s next quarter-century. Running Time: 1 hour, 40 minutes with one intermission. On Clover Road runs through August 2nd 2015 at the Frank Center Stage, 260 University Drive, Shepherd University in Shepherdstown, West Virginia. For tickets call 800-999-CATF (2283), or 304-876-3473, or click here.